On September 8th I attended the inaugural Fatigues to Fabulous Tribute Fashion Event in the South Courtyard of Lincoln Center, during Mercedes-Benz Fashion Week Spring 2012. The show honored six female veterans wearing designs by Charlotte Ronson, Bill Blass, Kardashian Kollection, Donna Karan, Calvin Klein and Carmen Marc Valvo. Their stories are an inspiration to all, as they had discussed the challenges and hardships they have faced in their military career and how they had overcome them. We are all amazed at their courage, fight, determination and accomplishments. Fatigues to Fabulous (F2F) is the first multi-year national campaign solely dedicated to raising awareness of the unique issues and challenges facing our female veterans. The F2F campaign taps into the popularity of the Fashion Industry to raise awareness of the plight women veterans face, initiate a national dialogue on the issues affecting military women and raise funds to support research and the development of services. From left to right: Jennifer Crane in Charlotte Ronson, Sarah Franson in Bill Blass, Christina Dibble in Kardashian Kollection, Meredith Perry Smith, D.O. in Donna Karan, Serena Hayden in Calvin Klein and Ann Marie Faison in Carmen Marc Valvo. 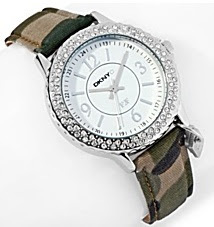 The event also featured the launch of the DKNYC Commemorative F2F watch, $59.95, available exclusively at HSN and HSN.com. 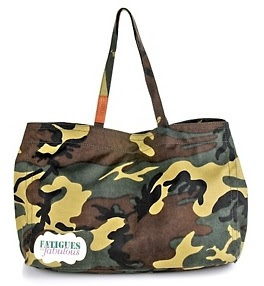 Check out this DKNYC Fatigues to Fabulous Camo Tote, $29.90.